Awoke at 6 to the sound of rain hammering comfortingly on the roof of my attic bedroom (I'm convinced it's a foetal thing) and used every ounce of energy to climb out and fall into the bath. Well, not literally but you get the picture: it was early, I was still tired after a hard night putting together Britain's third best-selling quality daily newspaper (actually, I think it might be second on Saturdays). Anyway, I struggled from the day job in publishing to the "hobby" publishing job and then remembered that I'd come home to a nice heavy box by the front door (one of the neighbours must have signed for it) from Beth Chatto. 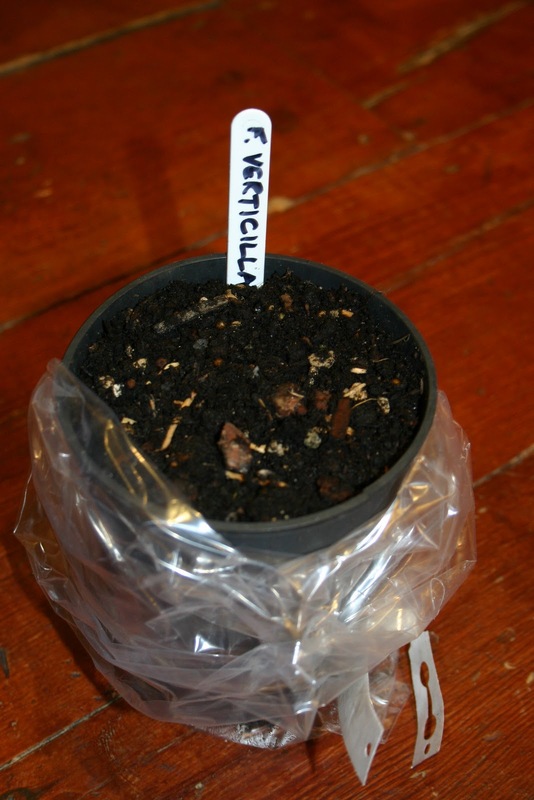 If you recall, this was the order of Fritillarias verticillata and persica that I'd had to make up to the minimum of £30 with the addition of some Lilies and yet another Digitalis. As we covered Frits pretty comprehensively yesterday I won't bore you too much with them, only tellling you that the persica bulb is ENORMOUS! It's too dark to photograph right now but you could have a fun, if very short and expensive, game of cricket with it. I'm not sure I've a pot big enough to accommodate it which might necessitate a trip to the Very Expensive Garden Centre. Verticillata came already potted in a talllish plastic pot, not unlike those you get Clematis in and if that's good enough for Ms Chatto, it will do for me. The planting medium is extremely light and open with bark chips and gravel so they've obviously put some thought into it and who am I to contradict such experts. Besides, I tipped the contents gently out and root growth is well under way so I quickly slid it back in and will leave it to it. 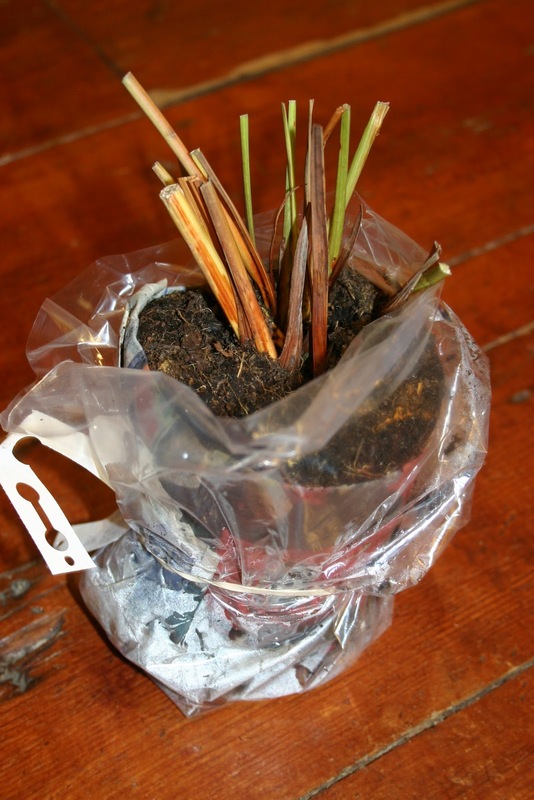 Persica came in a polythene bag and peat, as did the Lilies: hansonii and speciosum rubrum. Digitalis parviflora and Gladiolus papilio appear to have been removed from pots and the rootball wrapped in wet newspaper ready for planting and the whole thing was very well packed with plenty of damp paper and shredded dry paper to keep everything in excellent condition. So top marks to Beth Chatto garden's mail order service. 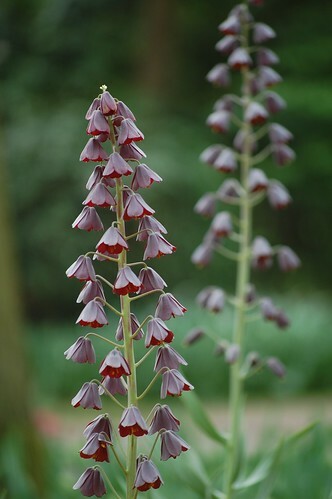 ... (Some time later): well, speciosum comes from shaded and moist places in forests and grassy slopes at 600-900 metres in the far east, much as expected. Planting depth is recommended at 15 cm so it's a basal rooter which means I won't need too deep a pot. Hansonii is a stem rooter which could reach over a metre in height so I'll plant it a little deeper. Gladiolus papilio with this year's foliage still attached . It's tempting to have a good dig around to see what form the bulbs take. Are they like the corms of those huge gaudy hybrids? Digitial parviflora is another of those odd orangey -brown jobs, a bit more like ferruginea than the more recognisable purpurea of our British hedgerows and woodlands. All are erect plants reaching a metre or so in height (with the exception of Gladiolus papilio and F. verticillata which are a bit shorter) so bearing in mind how windy it can get up here, I'm going to have to choose sturdy planters, ideally square-bottomed, which means either waiting till Columbia Road flower market tomorrow and paying over the odds for something fancy that will be hidden by other foliage or heading up to the expensive garden centre todaywhere the pots are actually quite reasonable. I'd really like to get them in today, so hopefully one of the crafty shops in Columbia Road will be open today (they often do to catch passing trade before the chaos of the market). Just glad the 75L bag of compost has arrived! Right, it's light enough to go outside and plant these babies! What the f...... !!!???. This is what I found when I unwrapped the Gladiolus! A huge collection of bulblets at the bottom of the pot in which it had been grown. 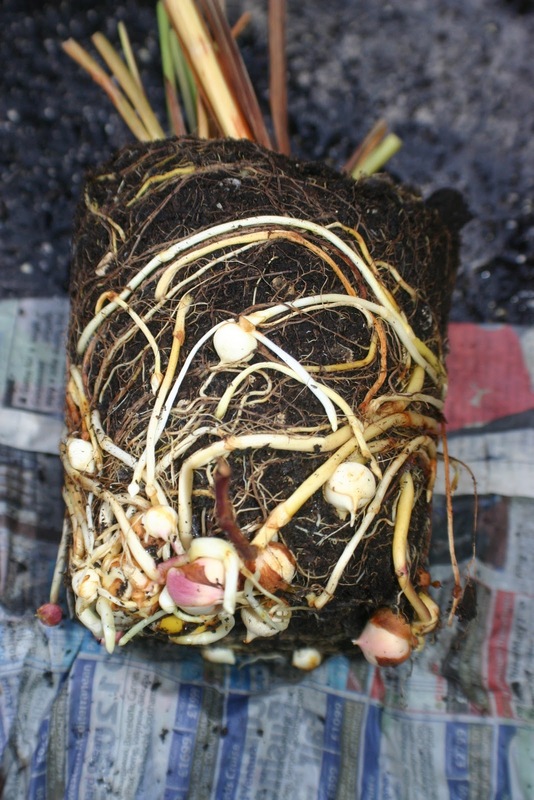 At first I thought It had been planted too shallow, but when I scraped back the top layer of compost I found bulbs there too! So I got myself a big pot and potted the lot up without disturbing it. This may or may not have been the right thing to do, perhaps teasing some out and spreading them around would have been better but I can always do that later. Best to leave well alone, my instincts (or green fingers as others would have it) say let it be. 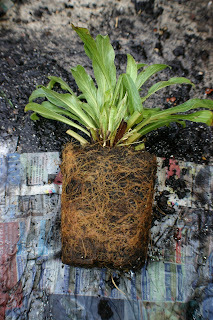 In other news, the Dianthus cuttings I took last week are rooting already (amazing what a bit of bottom heat will do!) and the candelabra Primula species I pricked out earlier in the week are off to a flier, satisfyingly. If you're in the garden today, have a good one, if you're not, why not? Christmas certainly came early for you this year. Great post! Love the Gladiolus papilio and I am a big fan of Frits, you can never have enough of them in the garden. Thanks Yolanda, I got so carried away I took off to the garden centre and spent £83 on four fancy containers for the trumpet lilies I'm still waiting for from van Meuwen bulbs. Lovely collection of photos and 'presents'...good for you. F. persica is a lovely thing but it's marginal here. I grew it one year, it didn't come back the second, so I just admire them in milder climates now, via the wonders of the blogosphere.